Tall trees extend out over the still surface of a river from a bank receding from left to right. Before a thatched cottage in the middle distance, a ferryboat heavily laden with passengers and livestock poles off from the shore. Fishermen in boats silhouetted in the shadows attend to their nets, while farther down stream sailing vessels seem becalmed before a windmill. The cloudy sky with patches of blue sets off the earth colours of the land and river below, while the darkened water fills the entire foreground, enveloping the viewer in the scene and creating the illusion of spatial relief in the distance. Jan van Goyen painted river scenes throughout his life and his sketchbooks attest to his practice of drawing in the open air from life in vessels afloat on Holland's countless inland waterways. Following the example of his teacher, Esaias van de Velde, Van Goyen depicted river views with overbooked ferryboats at least as early as 1627-1628. By 1629 he had developed in these scenes the diagonal designs and restricted "tonal" palette for which he and Salomon van Ruysdael are famous. 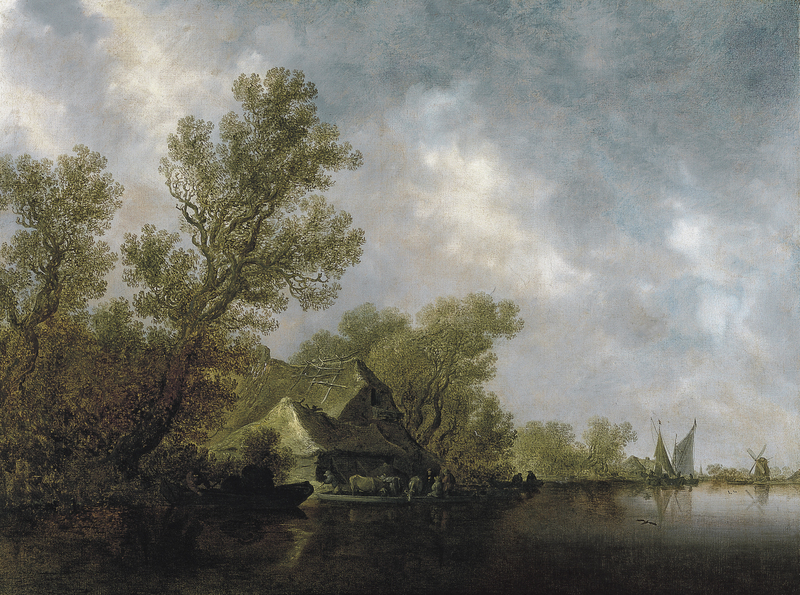 During the early 1630s he continued to favour the subject, dating, for example, at least one half dozen river landscapes in the year of this painting. At this same time, Van Goyen also experimented with larger, more freely executed compositions. In three of his other river landscapes from 1634 all of the canvases boast a horizontal dimension greater than 100 cm. During this year, Van Goyen was also documented as active in Haarlem, painting in the home of the artist, Isaack van Ruisdael (1599-1677), who was the brother of Salomon van Ruisdael and the father of Jacob van Ruisdael. The resemblance of the present work and other river views from this period to Salomon's mature art is conspicuous; the diagonal composition with tall leafy trees jutting out over the water, the tall sky, and the use of the ferryboat and other vessels for spatial demarcation and enhancement is common to both artists' work and seems to attest to reciprocal and mutual influences.